Named Big Snake Creek in 1841, Oleta River State Park was a place discovered by many settlers over the decades. By the 1890s, there were pineapple and vegetable farms popping up all along the river, which connected the Everglades to Biscayne Bay. In 1922, Big Snake Creek became Oleta River and a restaurant was opened nearby 16 years later. That restaurant, named Blue Marlin Fish House, turned into a smokehouse and shut down in the 1980s, but as of 2007 it’s back in business with smoked fish and wraps on the menu. Today, the Florida Park Service manages Oleta River State Park and it’s a perfect place to spend a day with family and friends, exploring all the outdoor wonders South Florida has to offer. Open from 8 a.m. to sunset every day of the year, Oleta charges a $6 fee per vehicle and you can even camp there if you’d like (the old fashioned way or the “glamping” way in a cabin). There are countless things to do at this park, from fishing and picnics — picnic areas are available on a first come/first serve basis — to biking, paddleboarding and swimming. There’s a chance museums, visitor centers and historic sites in the park will be closed two days per week (hours also vary). Check Oleta’s website for opening and closing hours, closures and other details. Besides the obvious like swimming, sunning and barbecuing, there are still so many ways to spend the day here that you might not even have thought of. Oleta is Florida’s largest urban park and and it includes 15 miles of off-road biking trails and access to the 1,515-mile Florida Circumnavigational Saltwater Paddling Trail, which is divided into 26 segments and wraps around Florida in a way that it stretches from Pensacola to the Keys and all the way up to Fort Clinch State Park, which is near the Florida-Georgia line. If you’re looking for outdoor adventure, there’s no shortage of it here. Amenities at Oleta River State Park include 14 cabins with covered porches and picnic tables. Most have one double bunk, one bunk and air conditioning and they are available for rental up to 11 months in advance. Linens aren’t provided and showers are located nearby. This is more of a camping experience than hotel stay, for sure. There are also a plethora of amenities on site including beach wheelchairs, beach access by mobi-bats, canoes, canoe and kayak launch, restrooms, a fishing pier, grills, picnic pavilions and benches and more. In addition to the Blue Marlin Fish house (open 11 a.m. to 7 p.m. daily), there’s also the BG Oleta River (open at 9 a.m. daily until 1.5 hours before sunset), a concession that rents canoes, kayaks, stand up paddleboards and mountain bikes. BG Oleta River also sells general merchandise, bait and snacks. 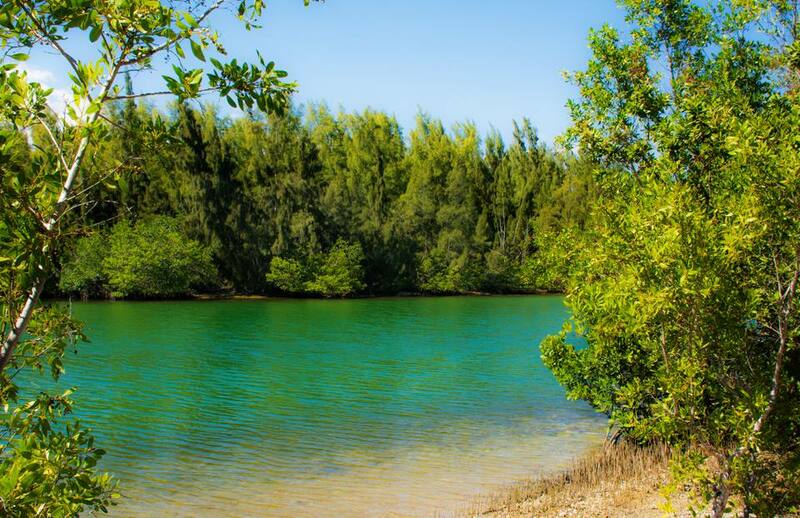 Just 30 minutes from downtown Miami, Oleta River state park is accessible by car. There are multiple ways to get there, whether by taxi, bus, Uber/Lyft or your own ride. From the south, you can take I-95 Express. If you’re coming from any other direction, consult your Smartphone or GPS; traffic can be less than magical in the Magic City sometimes, so it’s probably best to confirm the most seamless route to Oleta the night before your visit. Plan your trip accordingly so you miss both bouts of rush hour. No one likes being stuck on the highway, especially before or after a grand outdoor expedition. ﻿Not far from Aventura Mall, Oleta is just a stone’s throw from some of the best shops, restaurants and beaches in South Florida. If you work up an appetite at the park, head to Oishi Thai for sushi by a chef who once worked as the sous chef at Nobu. At Oishi Thai you can have any Japanese or Thai dish your heart desires, namely dishes like ramen and chicken katsu, sushi, sashimi and so much more. Pair your meal with hot or cold sake or a Japanese beer. You’re also close enough to both Miami and Fort Lauderdale so maybe take an afternoon to explore F.A.T. Village, Fort Lauderdale’s artist community that’s bubbling with creative energy, coffee, cool workspaces and more. Grab a drink here and take advantage of the air conditioning before heading back to the beach for a fab South Florida sunset.